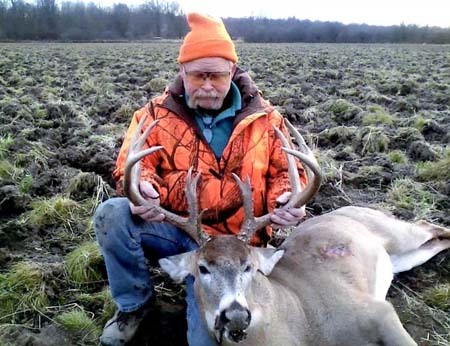 On opening day of gun season, November 19, 2011, my Dad had opted not to hunt the morning. Being a self-employed contractor, he decided to work that morning and hunt in the afternoon. He went to a client's house in Livingston County and worked most of the day transplanting trees with a tractor. At around 3:30 p.m he heard some shots about a half-mile away. Several minutes later, he looked and could not believe his eyes. A huge buck and a doe were running across the field 400 yards away. He quickly grabbed his Smith & Wesson .44 Magnum, coat, and gear off of the tractor. Both deer had stopped, so he figured he could use a nearby hedgerow to get close enough for a shot. When he had crawled to within 100 yards, he decided to take the shot. Laying on his stomach, he raised the Smith & Wesson, centered the holosight behind the buck's shoulder, and squeezed the trigger. The buck went only ten feet before going down. When my Dad reached the buck, he could scarcely believe it. No ground shrinkage here! He had a massive 13-point rack with 10-inch G-2s, but his most unique feature was the double-split brow tines. Dad blinked several times and pinched himself to make sure the whole thing wasn't a dream! Back home that night, everyone was on cloud nine. After hanging the buck up, we took lots of pictures. We later learned that this buck was known in the neighborhood as "The Split-Brow Buck". Several other hunters had trail camera photos of him, and another hunter had shot at and missed the buck shortly before my Dad harvested him. When the 60-day drying period ended, he was officially scored at 155" gross and 142-4/8" net. 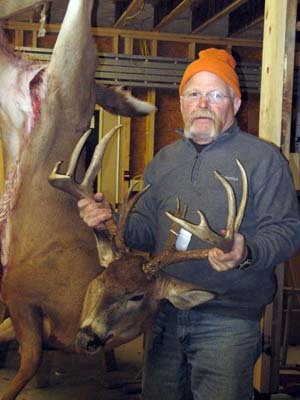 The 2011 hunting season was definitely one to remember, with both myself and my father downing a wall-hanger!